Today HRH Crown Princess Mary gave out The Crown Princess Mary Scholarship to two Australian exchange students studying at the University of Copenhagen. - Thanks to student exchange, each year thousands of young people criss-cross the world and like little threads you help us all to come a little closer together. By choosing to come to Denmark and spend a semester here in Copenhagen, you have become part of that ever-growing piece of needlework, said HRH Crown Princess Mary in her speech to the two Australian exchange students. 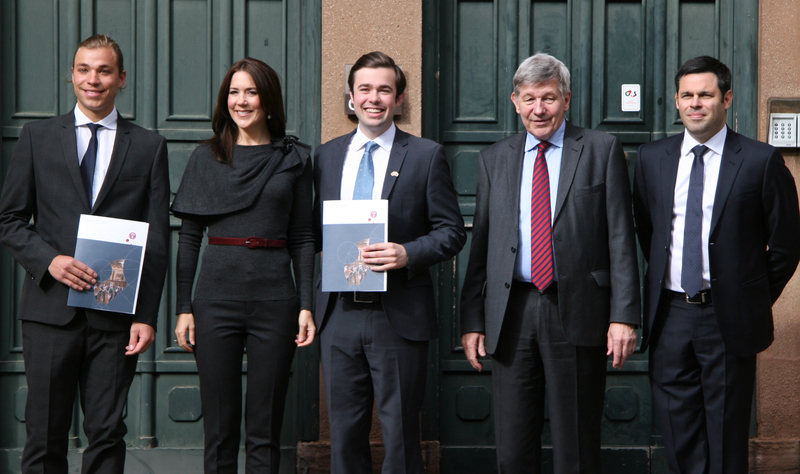 The Australian exchange students, Morgan Leon Foulsham from Macquarie University and Cameron Hunter from the University of Sydney, received the Crown Princess Mary scholarship today at the University of Copenhagen. Morgan is studying a master in Law and Media at the Macquarie University on his fourth year. He is described as an engaged student besides being academically gifted. Morgan is involved in a number of voluntary organizations - both of social and charitable purposes. He has outstanding recommendations from his home University and is credited for being ambitious as well as possessing remarkable leadership skills. Cameron Hunter, HRH Crown Princess Mary, Morgan Leon Foulsham, Rector Ralf Hemmingsen and Australian ambassador Damien Miller. Cameron is studying Chinese Studies and International Relations on his bachelor. Doing his stay in Denmark Cameron has learned to speak Danish. Besides Danish Cameron speaks Chinese, German and Spanish. Cameron has outstanding recommendations from University of Sydney. He is credited for being motivated, hardworking and extremely creative. - At your home universities both of you have demonstrated academic skills of outstanding standards. But equally important, both of you appear to have a catching enthusiasm to go beyond textbooks and cease the opportunity to engage in voluntary extracurricular activites, said HRH Crown Princess Mary in her speech to the two Australian exchange students. Every year the University of Copenhagen receives almost 2000 exchange students. The US, Australia, Germany and Southern Europe are the main providers of exchange students arriving at the UCHP. The press is free to use the photos on this site. Click on the photos to download in full size. Please credit: University of Copenhagen. 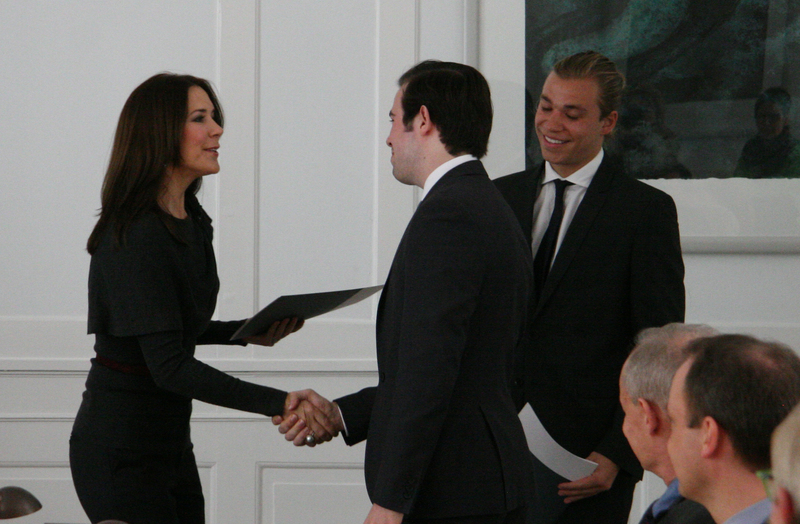 The Crown Princess Mary Scholarship is being awarded for the eleventh time. The scholarship is a part of the University’s wedding gift to the crown prince couple in 2004. Two scholarships are given to exchange students from the University of Copenhagen’s Australian partner universities. The scholarships of 10.000 DKK each are thought as an economical helping hand with the stay in Denmark. Each Australian partner university is invited to nominate one of their students, who are going on exchange to Copenhagen, to the scholarship. Afterwards a committee will nominate two recipients to Rector, who will then make the final approval.